Hungary rejects the European Union’s refugee quota system as a country that has received significantly more migrants than the number of refugees the EU recommends redistributing, Foreign Minister Péter Szijjártó said on Tuesday. Meanwhile Budapest’s Keleti railway station was entirely shut down for a brief period and, though it was reopened later, admission is only granted for those who have proper documentation necessary to travel abroad. “The EU has talked of redistributing 60,000 people but Hungary alone has seen an influx of 160,000 migrants so far this year,” Szijjártó said after talks with Slovenian Prime Minister Miro Cerar and the Foreign Ministers of Slovenia, Karl Erjavec, Bulgaria, Daniel Mitov, and Macedonia, Nikola Poposki, at a conference in Bled, Slovenia. Hungary also objects to the EU policy because it encourages migrants and human smugglers, he said. People who were taking meaningful action were “victims of an organised smear campaign and criticism based on lies”. Hungary had also been a victim of such a campaign. Szijjártó said the situation on the Western Balkans is dramatic. Neither Macedonia nor Serbia could be expected to stop the flow of migrants because the people are entering from EU countries, he said. The minister noted that Hungary is pushing for representatives of EU member states to hold a conference on the crisis in Budapest as soon as possible with the participation of Western Balkan countries and Turkey. He reassured his colleagues that Hungary would continue to abide by EU regulations, including the Schengen rules. Member states were responsible for protecting the EU’s borders and enforcing the laws on crossing them. On the same day as Szijjártó was speaking in Slovenia, police closed down Keleti railway station, the main terminal for westbound trains. 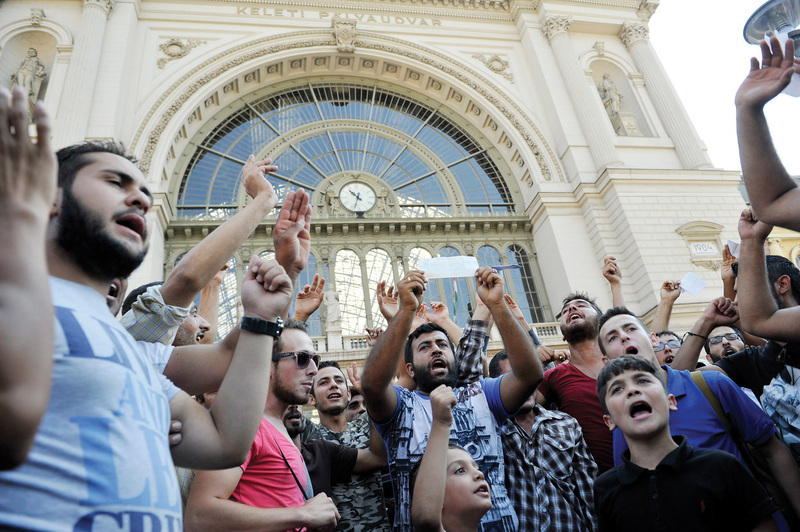 After the station reopened, migrants hoping to board Railjet services to Vienna and Munich were still not allowed to enter, so they started a protest outside the terminal waving their valid train tickets. An opposition Socialist politician who chairs Parliament’s national security committee says “there are signs… various terrorist organisations and terrorists” are trying to take advantage of the migration wave to get into the European Union. 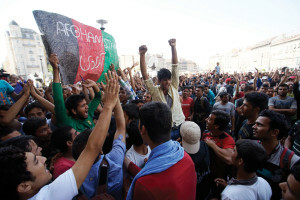 Zsolt Molnár said the threat is from the direction of the Balkans, Asia and North Africa. He said migration, terrorism and illness “do not respect borders”. Hungary was incapable of handling these problems alone, even in the short term, and must cooperate with other countries. Molnár said the government had correctly predicted the developments this spring but still failed to act in time, and introduced only superficial measures to manage the wave of migrants. On Tuesday evening the Hungarian national police headquarters (ORFK) said in a statement that officers are seeing to border control duties in complete accordance with regulations prescribed by the Schengen codex. 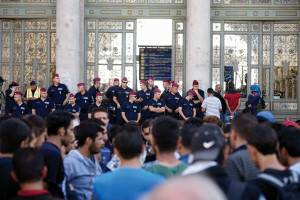 The statement added that the police presence in and around Keleti was being beefed up with civil guards since the number of migrants had grown dramatically over the past five days. The vast majority are Syrian nationals, illegal migrants wishing to travel on to Austria and Germany who do not possess the proper documents to do so, the statement said. It noted that Hungarian, German and Austrian police are carrying out joint patrols to monitor trains traveling along the Budapest-Vienna-Munich route. 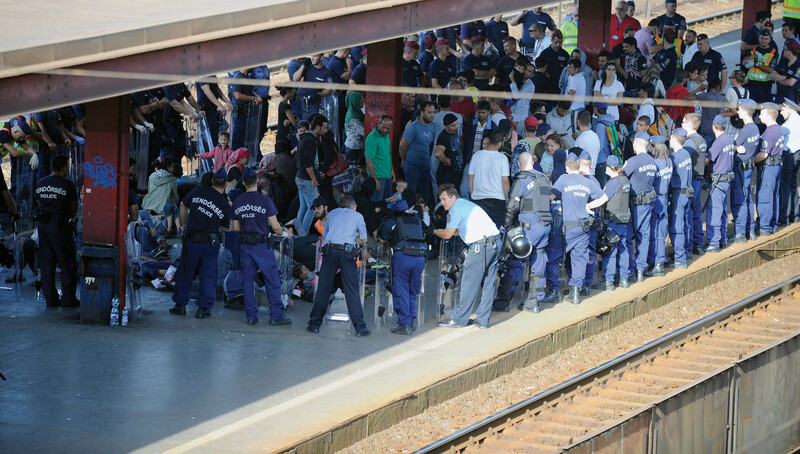 Hungarian and Slovak police are doing the same on trains bound for Bratislava. The national railway company said only passengers with proper travel documentation – and visas where appropriate – would be allowed on trains in the direction of Western Europe. Also on Tuesday state secretary Levente Magyar said Hungary firmly rejects any accusation that suggests its actions concerning the issue of migrants are wanting. Magyar told a news conference that the criticism was paradoxical, first accusing of being too strict by building a fence along the Hungary-Serbia border,and then for being too lenient by allowing migrants to travel on without valid documents. “There is some chaos in some heads whether to criticise Hungary for its rigour or for its indulgent immigration policy,” Magyar added. Chaos and conflict threaten target countries that fail to limit the admission of migrants, Speaker of Parliament László Kövér said in New York. Addressing the Fourth World Conference of Speakers of Parliament on Tuesday, Kover said the spotlight of responsibility should fall on those who cause the migration crisis as well as on receiving countries. Kövér voiced support for the conference’s draft statement calling on recipient countries to meet their obligations. He added, however, that “we must also focus our attention on other factors. First, on the responsibilities of the countries where migrants are coming from, second, on the responsibilities of the countries that caused the crisis which eventually triggered the emigration wave, and third, on the responsibility of criminal gangs and political groups profiting from the migration. “Accepting migrants without restrictions has sustainability-related and institutional limitations in destination countries. Disregarding these limitations will undoubtedly cause unprecedented chaos and serious conflicts in these destination countries as well,” Kövér warned in his address. He said that as a member of the EU, Hungary is obliged to register illegal migrants and verify whether they have valid travel documents should they wish to travel on. Being registered in Hungary did not automatically entail the right to travel to another EU country. He noted that Austria had made a unilateral move when on Monday morning it “closed roads” to that country, insisting it was Austria’s sovereign right to do so. Magyar was referring to strict road and train control introduced by Hungary’s western neighbour that caused significant delays to trains and a 30-kilometre traffic jam on M1 highway, the main road leading to the western border. Police detained opposition Democratic Coalition (DK) board member György Kakuk on Tuesday for cutting the recently completed razor-wire fence on the border with Serbia near Roszke. Before cutting the wire, Kakuk held a joint press conference with Serbian journalist Milica Mancic Stojkovic and said the fence had no practical rationale because it could not reduce the number of migrants arriving in Hungary. At the same time it goes against basic European Union principles and drives up the price human smugglers are charging, benefitting organised criminals, he added. Police said cutting the wire was an offence against property, which Kakuk had acknowledged. Fidesz said after his detention that DK, headed by Ferenc Gyurcsány, had been “bought” by the European Commission. Gyurcsány’s family business is financed by the Jean-Claude Juncker-led EC, so “it is no surprise that Gyurcsány and his people are parroting the EU’s failed migration policy”. Kakuk was later released from custody. According to Austrian authorities, the road checks were necessary to examine all vehicles that can be used for smuggling humans across the border. The decision was prompted by an abandoned van found on Austria’s A4 motorway last month filled with the bodies of 71 dead migrants, including four children. After the truck was found, Hungarian and Austrian authorities started a manhunt and Hungarian police arrested three Bulgarians, an Afghan national and a fifth person . Burgenland province police chief Hans Peter Doskozil said there were 59 men, eight women and four children dead. The children included an infant girl and three boys aged 8-10. He said the migrants are likely to have suffocated but further investigation, including the investigation of mobile phones and bags found in the vehicle, is needed. 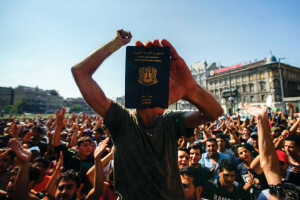 Gábor Schmidt, the Bács-Kiskun county public prosecutor’s spokesman, said the migrants entered Hungary from Serbia illegally and were transported from Kecskemét to Austria. The prosecutor’s office said the preliminary detention of the suspects was necessary because they have foreign affiliations and pose a flight risk. Contrary to what the government claims, it is the migration policy of ruling Fidesz rather than that of the European Union that has proved a fiasco, opposition Együtt party said on Tuesday. Nóra Hajdú, a member of the party’s board, called on the government to show more humanity and ensure greater security in migration affairs. 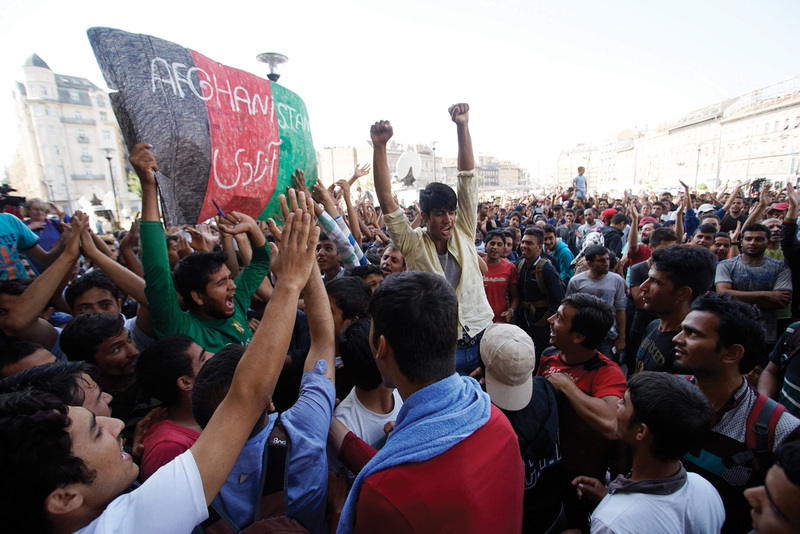 The cabinet should reveal what it has done to shape EU immigration policies. Accusing Fidesz of impotence and cowardice, Hajdú said the party had resorted to law enforcement measures when the problem at hand was much more complex. “What makes the matter even worse is that leading Fidesz politicians are making racist and anti-Islamic statements,” she said. Fidesz viewed the EU purely as a source of funding and did not identify with its values. get rid of that communist that is running your country ORBAN MINATURE PUTIN. I can see your the real COMMIE! Go away! Mr Orban please take a head in EU government and save us! Merkel and Holland got crazy! Those people are not our repsonsablity, Europeans are not responsible for their misery. We want to live in a catholic Europe with traditions, respect, love…. Why do USA, Canada and closer culturally similar countries like Emirates, Katar don’t take this responsibility! Why do those people don’t stay in Eastern or south Europe but go to France, UK, Germany, Sweden? If it was for the war they would be happy in a safe place. This is not the case, it is clear that their aim is the social money that we will all have to pay! You are the only one who say things as they are! No! for this kind of Europe! But there is no home for ISLAM as it exists in those countries. If they stay like anyone else, they’ll have to learn and love the smell of PORK and be prepared to serve it if guess arrive as in the eastern euro countries or face land expropriations as in the past. Google it and see for yourselves…. The Guardian – British newspaper. As the French president, Francois Hollande, put it on Monday: “It’s true that Britain is not in the Schengen area … but that doesn’t absolve it from making an effort in terms of solidarity,” making clear there would be a price to be paid when Britain in turn demands ‘solidarity’ over reform of the EU. Yeah….let’s bully all the other EU members into accepting your ridiculous quota. Merkel acted alone, but is asking for European solidarity whenever it suits her. There is no solidarity, just political bullying from Germany and France. First of all, Robert and Donna, Hah! are transgendered trolls. Nick, you are right on. Ed, NO, a little country that is having to deal with a ridiculous influcs of illegal migrants that cannot use force to protect it’s borders under shenghen (being taken advantage of) is not in a position to interogate ISIS plants. Notice how the media failed to block the fact that all migrants entering have very trim beards or non at all. Wait till they grow them back and enjoy your BAKLEVA! This is the first time I have ever seen a troll that’s also has had a gender change. You’re posting this same nonsense all over the internet, why, are your parents failed commies? It’s no secret about Hungarians past had you read the history books(written before 1939), especially about 1956(written after 1989). History does have good documentaries (today) on how the world sat by and did ‘nothing’ while the tyrant Brezhnev due to a case of sluggish schizophrenia attacked the people. Your comments only state what the world came to realize after the people plight, and out of a little but little compassion, offerred assistance. Canada, US, Brazil are states, not nations who have over taken indigenous tribes of people themselves to aquire their lands. Who are those countryies to ‘refuse’ rufugees such a the Syrians as they are today, Australia included. If Hungary, Austria , Germany or any other “NATION”, want to refuse right to their respective countries, they have that ‘right’ as “NATIVES” of their countries. So go away you ugly communist troll. By the way, like Ferris Beuller, “I Hate “ism’s” too. You Hungarians are the worse. Europe and the west helped you rebuilding your country. Now that we need your solidarity to help with this crisis you turn your back to us. You are not Christians, you do not give a damn about human rights and human beings, you are just pathetic selfish human beings. Just leave the EU, you do not deserve to be with us. Please state some facts or links. Nobody is interested in your personal failed relationships. I feel ashamed of going to Budapest to study. Too bad I decided to study there before this humanitarian crisis happen, and I can not get my inscription money back. I will do everything I can to help the migrants while I am there. Please don’t then, I have kids that will take your spot. Go somewhere else please, Hungary won’t waste time education the pointless. You feel ashamed and yet still you’re going. That’s called a hypocrite. And that’s probably the worst thing you can be.